The Great Barrier Reef should not go on a World Heritage danger list, according to a United Nations draft report. However, it says Australia must carry out commitments to protect the reef, including restoring water quality and restricting new port developments. The final decision on its status will be made at the World Heritage Committee meeting in Germany next month. 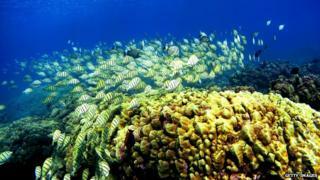 Conservationists have warned that the outlook for the reef is "poor". A report published in 2014 concluded that the condition "is expected to further deteriorate in the future". Climate change, extreme weather, and pollution from industry were listed a key concerns. However, in 2015 Australia submitted a plan to the UN heritage body, Unesco, outlining how it would address these threats. The Unesco draft report says that Australia must implement this 35-year action plan, and Unesco will continue to check on its progress. The matter - along with the future of other World Heritage sites - will be debated at a Unesco meeting taking place in Bonn from 28 June to 8 July. * It receives about two million tourists each year. The Great Barrier Reef was given World Heritage status in 1981. It is a vast collection of thousands of smaller coral reefs spans, stretching from the northern tip of Queensland to the state's southern city of Bundaberg. Greenpeace issued a statement saying the draft report was "not a reprieve - it is a big, red flag from Unesco". The group's reef campaigner Shani Tager highlighted the fact that the Australian government had been asked to prepare a report within 18 months. "Unesco now joins a long line of scientists, banks, organisations and individuals who are deeply worried about the reef's health," Ms Tager said. Prof Callum Roberts, a marine conservation biologist at the University of York in the UK, said he thought Unesco had made the right decision, based on "major progress" that has recently been made in the Australian authorities' approach to the reef. But he noted that the announcement was more of a postponement than a final judgement. "They're setting targets and they're obviously going to watch this very closely," Prof Roberts told BBC News. Prof Roberts also pointed to efforts by the Queensland state government. "The situation a couple of years ago was that the Queensland government was fast-tracking major industrial developments along the Great Barrier Reef coast - particularly a number of very large port developments which would service coal exports. "That has all been scaled back significantly. [The government] has also responded to the major impact of nutrient runoff from agricultural lands. "The outlook for the reef is a lot better today than it was two years ago."